A clear dose-response relationship exists between lung cancer risk and daily cigarette consumption. 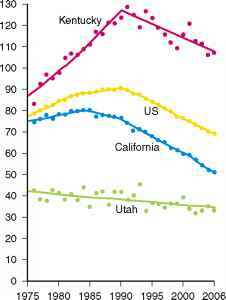 From 1950 to 1990, the U.S. mortality rate for lung cancer increased fourfold for men and sevenfold for women. Although the mortality rates in men have been declining since 1990, lung cancer is still the principal cause of cancer death for both genders. 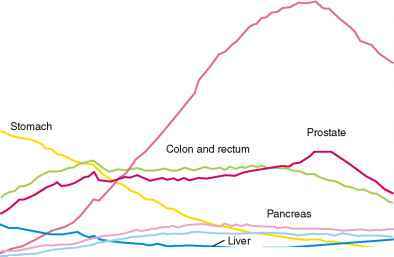 In 1988, lung cancer passed breast cancer as the leading cause of death from cancer in women (Fig. 50-3). 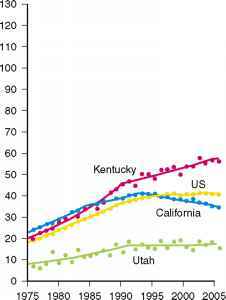 Although the lung cancer death rate has leveled off in U.S. women, in some states it is still increasing (Fig. 50-4). 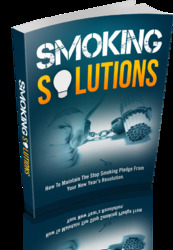 of 20 cigarettes a day to less than 10 per day reduces the lung cancer risk by 25% (Godtfredsen et al., 2005). A diminished risk for lung cancer is experienced in former smokers after 5 years of cessation; however, the risk remains higher than that of nonsmokers for as long as 15 to 20 years (US Surgeon General, 2004). Although the amount of tar in cigarettes has declined in recent years, the risk of lung cancer has not changed. Smoking formerly labeled "low-tar" and "low-nicotine" cigarettes provides no benefit over smoking regular cigarettes, and the uptake of carcinogens is no different in "regular," "light," and "ultralight" smokers (Hecht et al., 2005), as previously marketed. However, surveys show that most people believed "light" cigarettes to be less dangerous than regular cigarettes and regular cigarettes much more likely to cause illness. The recent federal legislation banning the use of words such as "light" from tobacco advertising is beginning to dispel this myth. Increasing data regarding the genetic predisposition to lung cancer are emerging (see Smoker's Genetics). Family aggregation related to lung cancer is likely multifactorial, including exposure to secondhand smoke, major genetic factors (e.g., chromosome 6p locus, CYP1A1 gene), other genes that modify risk of lung cancer, and genes that may enhance nicotine addiction or modify nicotine metabolism (D'Amico, 2008; US Surgeon General, 2004).